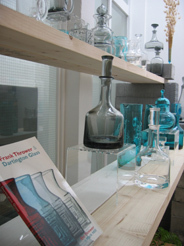 A major retrospective exhibition of Frank Thrower’s legendary designs for Dartington Glass was held from 2nd – 30th June 2006 at the Plough Arts Centre, Great Torrington in Devon. 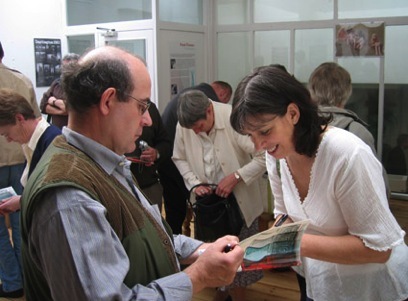 Consisting of the collection of Dr Graham Cooley, the exhibition opened with a special day of lectures, and a the launch of my ground-breaking book, written with Frank’s daughter Eve. 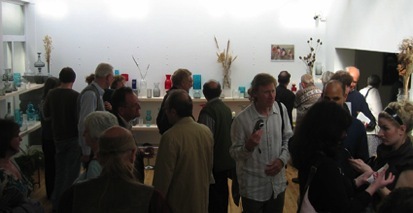 See below for pictures of the glass and the event. 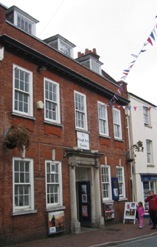 A professionally filmed documentary of Frank’s life and works, produced by Nigel Edwards of Inhouse TV and Graham Cooley, was also filmed during the opening weekend. 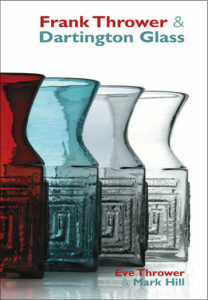 Including interviews with Frank’s children Eve and Kim, Graham Cooley, Charles Hajdamach, Frank’s colleagues and I, it’s essential viewing for the Dartington Glass fan and 20thC glass enthusiast alike. 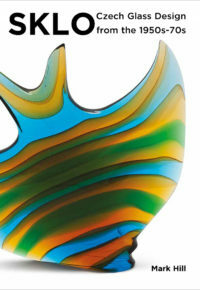 Sold by The Glass Association, click here to contact them and order a copy. Mark in a trailer for the hour-long documentary on Frank Thrower and Dartington Glass, sponsored by the Glass Association and broadcast on Sky Arts. The busy opening afternoon, with collectors travelling from across the UK and Europe to see the collection, meet Frank’s family and friends, and learn more. 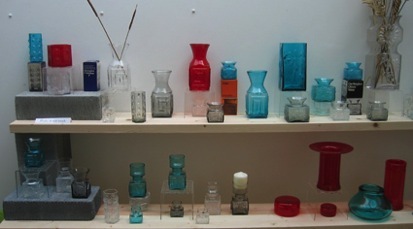 A view of the start of the exhibition, showing Frank’s earliest designs from the late 1960s, and his first designs for Dartington Glass from 1967 into the early 1970s. 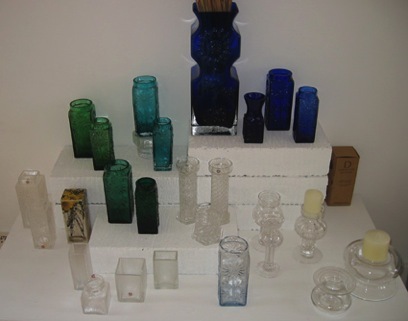 A closer view of some of Frank’s early designs for Dartington Glass. 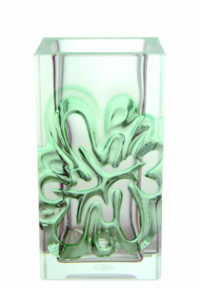 As well as being popular at the time, these have become highly sought-after by collectors. 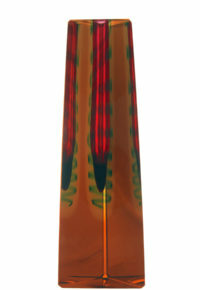 The red ‘Flame’ examples are particularly rare. A selection of Frank’s designs from 1967 into the 1980s. 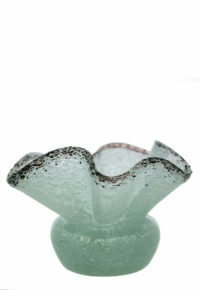 The large ‘Sunflower’ vase at the top was designed in 1967, and produced in colourless, Kingfisher Blue and Midnight Grey. It was re-released in 1993, being produced for a short period in this cobalt blue, colourless or green. 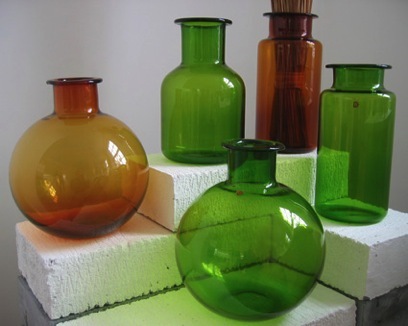 A series of mould blown vases designed by Frank in 1978, and produced for Dartington Glass at Woods Brothers. Reputedly, only one truck-load was ever made and delivered, making examples hard to find today. 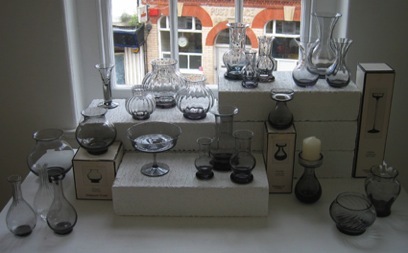 A selection of designs produced by Frank for ‘English Country Crystal’ range made by the merged Dartington Glass & Wedgwood Glass company from 1982-87. 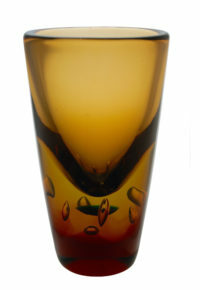 Colourless and Midnight grey are typical, as is the optical ribbed effect.